If you are like us, you likely have a deep-rooted love for cheese and cheese products. With the wide variety of cheeses available, it can be hard to determine where you should start first. However, by starting with these 3 must-try products, you can tantalize your taste buds and start your journey into the world of Watonga Cheese Factory’s delicious products. When manufacturing cheddar, the curds are generally considered the freshest part of the cheese because it still contains a small amount of moisture. Although you may just see curds as a straight cheese product, Watonga Cheese Factory curds are available in yellow or white cheddar, jalapeño, onion or bacon for an even more flavorful experience. 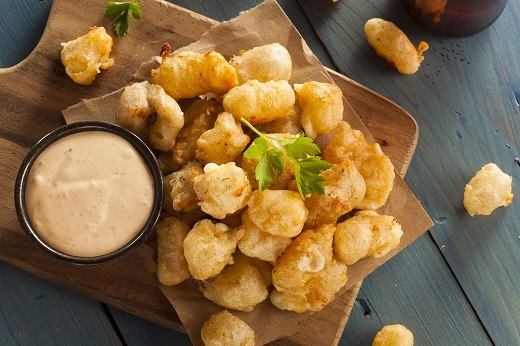 If you are looking for a fan favorite, cheddar cheese curds are one of our top must-try products! If you are looking for an all natural, premium cheddar that is made with no preservatives then our famous Longhorn Cheddar is the product you’ve been searching for. If you have an insatiable appetite for cheddar or regularly use it while cooking, we provide longhorn cheddar in a variety of sizes from one pound to five pounds. Try this excellent product and it’s sure to become a fan favorite as a snack or a valuable addition to your meals. While we are well known for our cheese products, we also offer Watonga Cheese Sausage as a perfect pairing to your favorite cheeses. If you are looking for an extra kick, we also offer our delicious sausage with the optional addition of jalapeños. Get it today with your favorite cheese product in a bundle or try it on its own for a wonderful experience! Watonga Cheese Factory has been providing high-quality cheese products since 1940. In addition to producing all-natural cheese, the factory has a retail store where you can buy its mild cheddar, sharp cheddar, bacon cheddar, cheddar pepper and onion cheddar cheeses. It also sells cheese curds, along with approximately 50 different kinds of other manufacturers’ cheeses. Want to learn more give us a call at (806) 648-4310 or contact us!